or visiting Boise, Idaho. Well, the rebujito is the Southern cousin of the kalimotxo...while up North warming red wine is the base alcohol, in the South they start with sherry, which originates in the Southern province of Cadiz. According to Ferrer, it's common belief that the rebujito originated among the English visitors to the South and one of their beloved cocktails, the Sherry Cobbler. The Sherry Cobbler was a pre-industrial soda version: sherry, lemon juice, sugar, and seltzer. However, Ferrer tells us that in Spain the drink really caught on as late as the 1980s, as a party drink. He recommends using a good fino sherry, such as Tío Pepe, or a manzanilla, such as Solear. But always, always a Fino or Manzanilla, as the Oloroso or Amontillado sherries can be quite dark and strong. He confided to me that he often subs the lemon-lime soda for tonic water, and the mint for lemon peel, to make a sherry-tonic that he swears by as super refreshing, dry, and slightly bitter. Add sherry to a pitcher full of ice. Add a few sprigs of mint and then mix in soft drink. 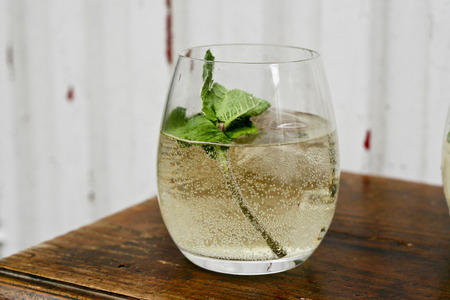 Stir, then serve (without ice, to avoid watering down) in individual glasses with a sprig of mint. For a drier, more bitter version, Ferrer recommends subbing tonic water for the soft drink and garnishing with a lemon peel. Makes one drink.